There are many planets and moons. However, for us on earth there is only one Moon. The Moon orbits the earth every 27.3 days. The time between new moons (synodic period) is 29.5 days because of the earth’s motion around the sun. The images here represent the 28 nights and a day of the lunar month. This photographic exploration of the Moon in high resolution, full lunar disk, images is personal and educational. The terminator is the boundary between day and night on the Moon. As the sun sweeps across the Moon’s surface, it reveals new details every day. Lunar features can be found and examined on any of the many excellent Moon atlases, both in print and interactive. However, subtle details of light and shadow are often lost in atlas images. I can find it difficult to reconcile the appearance of features in my telescope with the renderings in lunar atlases. I decided to record my own exploration of the Moon by capturing a high resolution image of the Moon’s disk for each night of the lunar month. Photographic images often fall short of capturing the contrast and detail that can be seen with the telescope. I’ve processed these images to reveal as much of that detail as possible, while remaining true to my views through the telescope. Many of these images contain details as small as 2km. The images can be appreciated simply for the beauty of the Moon. They are also intended to be used as a study aid to learn it’s features in depth. For this use, the images can be used with a lunar atlas for locating specific features. The observer can practice locating the features as if at the telescope. The Moon’s revolution around the earth is not synchronized to the earth’s day; thus each month’s daily views of the Moon are different. The Moon's orbit around the earth is also tilted with respect to its axis. Called libration, this results in perspective variations in what part of the Moon we see on a given day of the cycle. Clouds and viewing conditions vary as well. 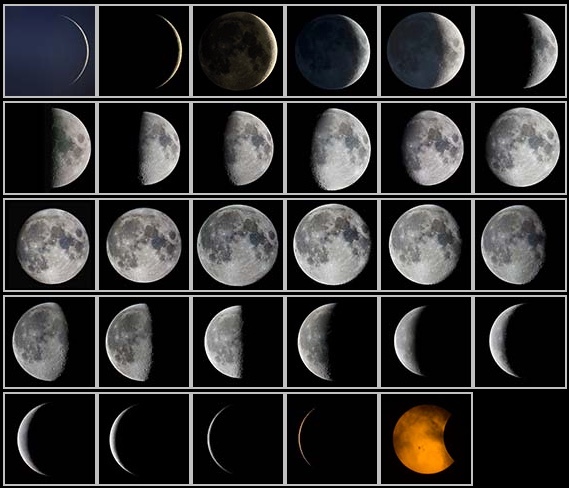 As a result, your view of the Moon on a given day of the lunar month will differ slightly from these images. The images in this project have all been made using the Questar 3.5" telescope, a near ideal instrument for full lunar disk images. Larger instruments show more detail under good conditions, but are limited to photographing small sections of the Moon at a time. The Questar can capture the whole lunar disk in detail in one shot with large sensor digital cameras. This makes it easy to capture many images for stacking to reduce noise and increase resolution. The most recent images in this gallery have been made using this technique. Over time I will replace older images in this gallery with better ones. My first full disk image of the Moon was a 72 image mosaic made with a small camera I built myself. I could not have finished this project without Sony's wonderful mirrorless APS-C size sensor cameras. They are a great match for the Questar and made focusing and collecting high quality data a pleasure. There are many wonderful images of the Moon. I want to acknowledge the amazing film photographers that were featured in the 1981 Questar publication "The Questar Moon". My admiration for these photographers and for any astrophotographer who works in film knows no bounds. Digital imaging makes astrophotography easier, however each image takes many hours of work. I can only imagine the difficulty of making beautiful astronomical images with photographic film. My friend Larry Martin's encouragement helped me believe other's might enjoy my "not so bad" images. Robert Reeves amazing close up images of the Moon and "365 days of the moon" project on Facebook were an inspiration while finishing this project.